Named as the UNESCO City of Design, Montreal is home to an array of festivals, tourist attractions, and unique architectural design for every tourist alike. Find yourself lost in the historical Old Montreal where dramatic architecture resides, or become educated at the many museums the city has to offer. The neighborhoods pops with vibrant color, streets lined with unforgettable design, and unlimited Montreal Hotels; it’s bound to satisfy the wanderlust of any distant traveler. Here are the most interesting attractions to visit while traveling through Montreal. An impeccable design consisting of 354 identical, prefabricated concrete forms is an experiment in apartment living and a model community designed by Israeli-Canadian architect Moshe Safdie. Located at 2600 Avenue Pierre-Dupuy on the Marc-Drouin Quay, next to the Saint Lawrence River, you’ll find the superb Habitat 67 which was originally built as a master thesis in architecture. This model community is one of the most recognizable and unique buildings in Montreal. One of Montreal’s most inviting streets offers something for everyone: culinary delights, bountiful greenery and vivid gardens. Bernard Street resides in the vibrant and trendy business and residential district of Outremont. Savor the sites with its turn-of-the-century architecture and enjoy a hot cup of delicious coffee while relaxing in one of the many patio dining cafes. This “Bio Dome”-like structure hosts exhibitions and scientific events that educate on the ways we can live as eco-citizens. The exhibitions address major environmental issues related to water, air, climate change, severe weather, and sustainable development. As the centerpiece of an urban oasis, the Biosphere offers a great view of downtown Montreal and the Saint Lawrence River. This spectacular building takes advantage of many green technologies like green roof systems, a living wall, wind turbines, and more. The Biosphere, located in the heart of Parc Jean-Drapeau, is a unique site to visit. This enormous public park and former military parade ground is one of the few spots in Montreal where you can find physical evidence of the fortified town of yesteryear. Champ-de-Mars is a relaxing space surrounded by trees, and offers a magnetizing view of downtown and fascinating historical remains. Conveniently found in Old Montreal and near the Auberge du Vieux-Port, this park is a perfect place to have a picnic with the family or get away from the fast-paced city. Located in the historic district of Old Montreal, next to the Saint-Sulpice Seminary, you’ll find a Gothic Revival architectural style church named Notre-Dame Basilica. This beautiful historical building offers an alluring view on the outside, with a colorful and grand interior decorated with golden stars and many different colors. The Roman Catholic church’s stained glass isn’t what you would think, as its art doesn’t depict biblical verses. 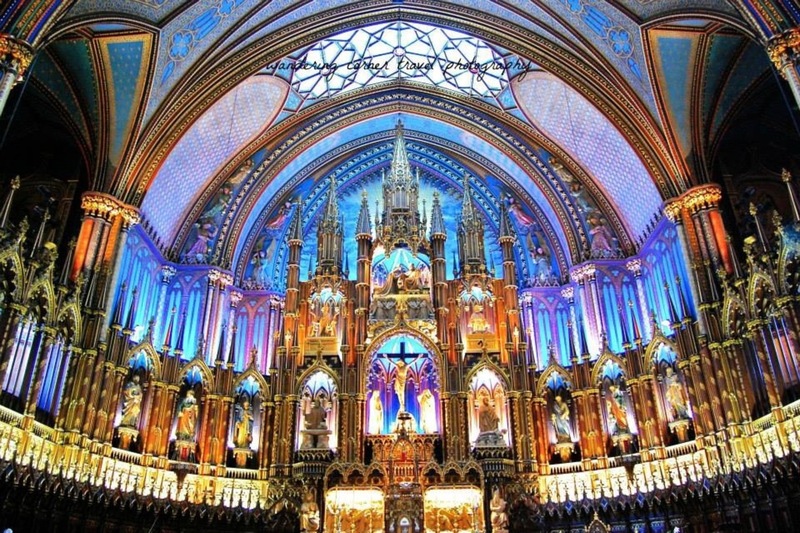 Rather, it displays scenes from the religious history of Montreal. The Basilica offers musical programming of choral and organ performances and charges a $5CDN entry fee, unless you’re there to attend mass.